We all have them, those tasks that we need to do, but hate to do. The trouble is that these jobs don’t get easier the longer you put them off; they get harder. Typically these are jobs which you have to keep doing, so the more you put them off, the bigger and nastier they get. Such as cleaning out the gutters, doing your laundry, doing the dishes or yes, doing your bookkeeping. In the chaos and disarray that was my leaving my little room and striking out on my own in Wanda, my routine of doing my bookkeeping was interrupted. I never quite got around to sitting down to do them as I usually do. My pattern was that twice a month, when I get paid I sit down and update my books from the last day to now. I download the latest activity from my bank account and enter my receipts. I make sure that it is up to date. If I do this on a regular basis this is not a problem as it is a small pile of receipts. If you wait and keep putting it off you will have four months’ worth of receipts to do. How do you tackle this? First of all you split the receipts into piles of each month, never mind what day, just what month, here, all done. 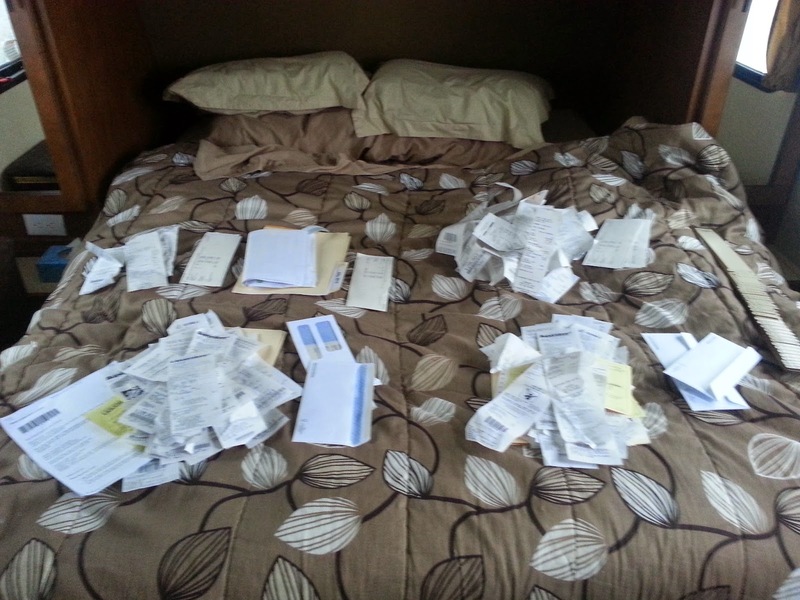 Then you separate out each paystub and the bank receipt that goes along with it. 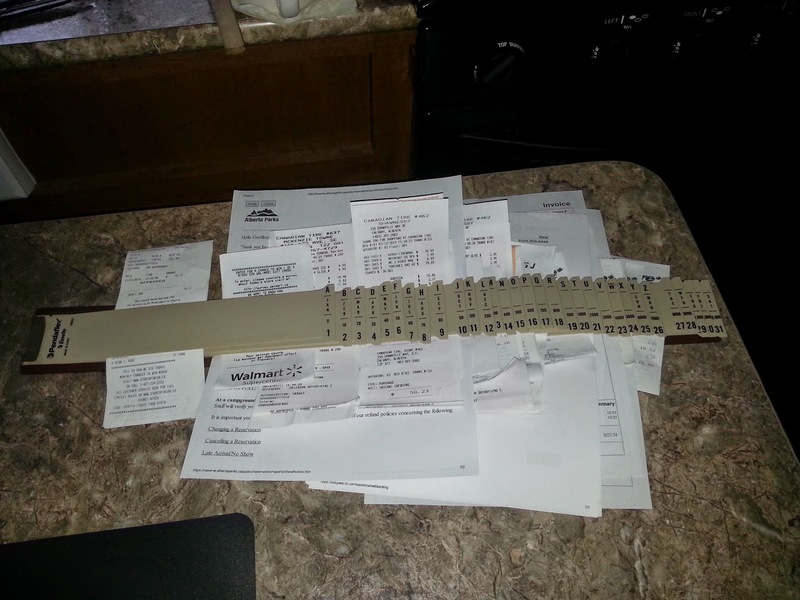 Next you pick up one pile of receipts and using a sorting board, separate them out into what day of the month. Here, all done. I told them that 1) I still need to do my bookkeeping and 2) it’s you guys that I don’t trust, so I need to keep a close eye on you! Alas this didn’t budge their “policy.” They are still sending me out paper statements though, so at least I can keep it up to date that way. I know that this will get easier as I am now back to using my cash system and my wallets for all of my purchases. It does keep me focussed and keep me on track financially. The one thing I learned was how steadily I trickled money out of my account on a daily basis. Trust me, locking your debit and credit cards up are a good way to save money. There is also a nice satisfaction about getting that job done, of doing that job you have been putting off. That sense of satisfaction is worth the dread and whining of not wanting to do it, of pushing through your own foot-dragging. So if you have a job that you have bene putting off, go do it, you will feel better afterwards.